Tis the season…for getting up early, rushing around and getting the kids out the door with healthy lunches in hand. As a mama of 2 I GET IT! I understand why there are SO many rich companies getting rich off of us busy mamas by selling us prepackaged foods read to throw into a lunch box. Unfortunately there are some problems when feeding our kids these pre-packaged lunches. Check out some of the nutritional downfalls of a popular pre-packed lunch item in Michael F. Jacobson’s Huffington Post Blog. They are not the most appetizing facts. Better yet-just grab a pre-packed grocery store item and look at the never ending list of ingredients. After feeding my kids fresh produce, homemade grains, organic meats and homemade snacks I can’t imagine what a Lunchables would do to their systems! The other downfall-THE GARBAGE! Oh. My. Goodness. It is disgusting to see the amount of waste that one class can produce during lunch (trust me-I used to be a teacher). It seems like everything is coming prepackaged these days, even crackers! Last year at a seminar I found out that the average elementary student produces 67 lbs of lunch waste a year! My other beef? Cost. I was at the grocery store yesterday and there was a sale on prepacked fruit (in those horrible plastic containers). It was $3 for 6 5 oz containers (that is the size of a Wean Bowl). I bought a bag of apples for $4.00. With that bag of apples, I can cut them up into the same cute size and fill about 10 5oz containers! So, now that you know WHY I want to pack LitterLESS Lunches lets put the challenge out there. 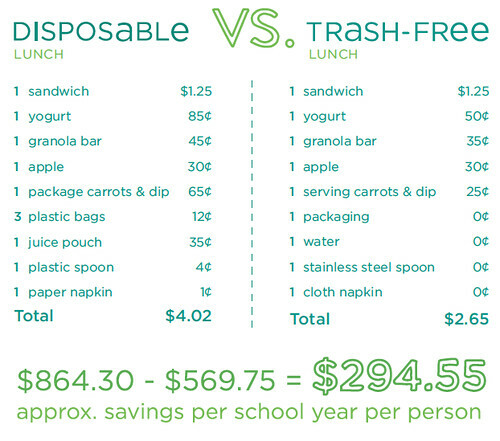 I am planning on making sure my kids have a LitterLESS Lunch every day of the 2013/14 school year. Don’t think you can do the full year with me? Try doing Grades of Green Trash Free Tuesdays! It is a great starting point for building a great habit and teaching our kids we care about the environment. Who is with me? Let us know in the comments what you packed and how you made it litterLESS. 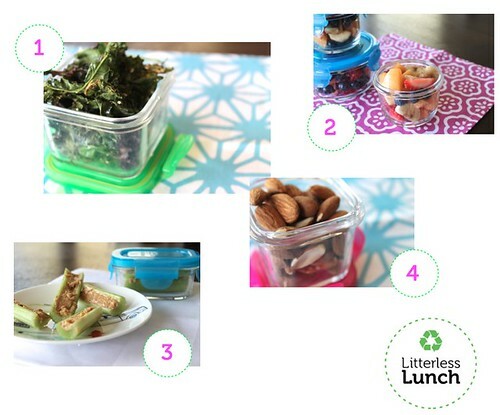 Every month we are going to choose 1 person from the comments of this post and send a LitterLESS Lunch prize pack (will include lots of goodies from our other friends that make cool products). This entry was written by Melissa, posted on September 11, 2013 at 9:00 am, filed under Eco-Friendly Living, Wean Green Contests and tagged back to school, cost savings, eco-friendly, grades of green, healthy kids, healthy lunch, homemade food, litterless lunch. Bookmark the permalink. Follow any comments here with the RSS feed for this post. Trackbacks are closed, but you can post a comment. My little girl loves the squeezable pouches and so I bought some reusable ones so that I can make my own!Costs less, is green and healthy! I give my daughter the classic sandwich-fruit-veggie combo and since it’s a little different every day she likes it. And I like it because it’s litterless and pricesmart. I love my Wean Greens! When we are out at the park, we bring litterless picnic lunches! Hummus and veggies, celery and peanut butter mixed with raisins and cinnamon, leftover pasta salad, cheese cubes we cut up ourselves, etc.